PANDA HAD ORIGINAL METAL PANDA BADGE RIVETED IN THE HEADTUBE. ALSO SIGNED BY CARLO LUCIA! Great find! What's the angle on that seat tube? yeah that is a crazy seat tube angle. i thought my hoffman condors with a 65 degree angle was way laid back lol. cool find! CORRECT...I PURCHASED IT FROM COLLEGECYCLERY ON SEPTEMBER 24TH FOR 190.94. IT WAS AN EBAY PURCHASE. DONT KNOW ANYTHING ABOUT THIS CAT. TOOK IT TO MY BROTHER WHO WELDS FOR GALLO WINERY AND FIXED THE SMALL CRACK BEHIND THE SEAT TUBE. THIS IS MY 5TH PANDA. I AM A STRAIGHT UP DUDE WHO HAS OVER 50 OLD SCHOOL BIKES AND BUILDS THEM IN MY SPARE TIME TO GET A WAY FROM THE OLD LADY.... THIS WAS A STRAIGHT UP EBAY TRANSACTION. I DONT F**K AROUND LIKE THAT. 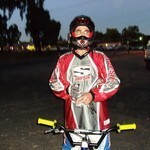 PEACE AND KEEP OLD SCHOOL BMX ALIVE!!! You know i will! i still race!!! Still a million bucks shy of being a millionaire. Building a Panda in white with black Ashtubula forks. Any help on Panda parts would sure help.